More than 483 businesses in the state were related to solar services as of 2016, helping to support the more than 273 megawatts of solar power. At current ranking, Pennsylvania is the 16th in the nation in terms of installed solar capacity, with another 348 megawatts projected to be brought online over the next five years. Though not considered on the forefront of the energy revolution, the recent rise in clean power generation counters the state's age-old reputation as a coal giant. According to the most recent data from market data portal Statista, the combined workforce of underground and surface coal mining in Pennsylvania amounted to 2,993 individuals in 2015. Despite the current president’s pledges to resurrect the plummeting coal industry in Appalachian states, many sources foresee its continued extinction, and cite numerous factors. Partisan accusations often fault the Obama administration’s legislation that sought to hedge the detrimental health and environmental effects of coal excavation and combustion, calling them “job-killing regulations” among other things. Coal’s killer, it seems, is natural gas. Cheap, domestically abundant, and “cleaner” than coal, natural gas production has more than tripled since 2005 and accounts for much of the new energy infrastructure in the United States. Almost hypocritically, President Trump is also a fierce advocate of utilizing domestic shale formations, which are the primary source of natural gas and can be found abundantly along the Dakotas, Appalachians, Texas, and intermittently in other areas across the contiguous United States. Large-scale retirements of coal-fired power plants, implemented by utilities for both economic and environmental reasons, have also undercut the total demand for coal. 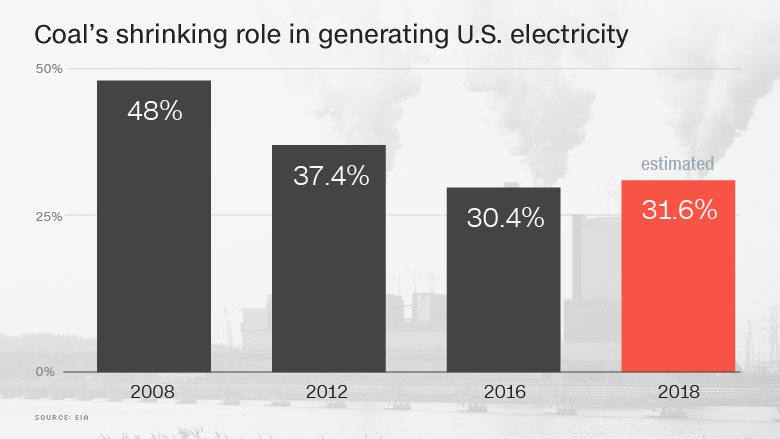 With coal-fired power falling to 30.4% of U.S. electricity generation, there is little reason to believe in its comeback. "[Coal employment] can't be brought back to where it was before the election of Barack Obama," said Robert Murray, CEO of Murray Energy, the largest American private coal mining operation. "I've suggested to Mr. Trump that he temper his expectations." Though little can be done to tamp the hemorrhaging of the coal industry, many experts hope that President Trump will, at the least, advocate for social and financial benefits for miners. In December, Senate Democrats shoehorned into a stopgap spending bill a demand for the protection of retirement and healthcare benefits for thousands of coal miners and their families. Led by Sens. Manchin (W.Va), Brown (OH), and Donnelly (IN), the addition advocated for the extension of benefits up until and beyond the funding bill's expiration in April. Though the proposal resonated with some Senate Republicans, the final bill was omitted the condition. The instance is just one in a long-standing uphill battle to provide benefits for miners, who often experience respiratory issues in later age. Other policy actors see the necessity for a modernization of the industry, and those it previously and currently employed. In an answer to a demand for not only benefits but employment, the Obama administration established nearly $28 million of grant funding for the "economic revitalization and workforce training in coal communities across the country". "Will coal come back to the level of 20 or even 10 years ago? I have my doubts," remarked Sheila Hollis, an energy matters specialist with law firm Duane Morris. "But I hope and pray there is some real assistance for coal miners."